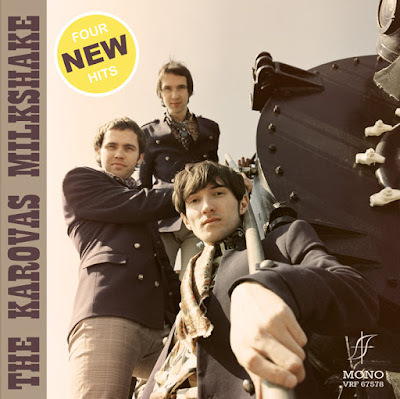 OK kids … I’m shaking my head with delight listening to this four song EP, unable to believe it’s not 1966 with The Karovas Milkshake in heavy rotation on late night AM radio, just before it gave way to FM, and while the FM music was a sheer delight, it was more serious, and a lot less fun. AM radio played anything that had a cool beat, anything that would get us girls up and dancing. But the EP is far more than that, it’s a hypnotic invitation, it’s a calling card, it foreshadows where Karovas Milkshake are gonna take you on a warm summer night. I still have a mile wide smile slapped across my face each time I hear this piece of swaggering time-shifting psychedelic garage pop blast through my speakers, reminding me for all time, that it was really super cool to have grown up in the 1960’s. *** The cassette edition of this EP contains the bonus song “Lies,” which won’t be found on the digital download.